This semester is going by so quickly – I can’t believe it. Only five weeks left in the semester, including this one, and then it’s finals and then my internship. I’m starting to feel like I haven’t done nearly as much cooking as I wanted to. Well, let me rephrase that. I cook everyday, but usually it’s lazy cooking. Pasta, sandwiches, whatever. I haven’t done as much fun and exciting cooking as I wanted. I’ve been experimenting with tempeh quite a bit, actually. I like the taste and texture better than tofu, and it’s more versatile too. I have a hard time putting tofu in anything that isn’t Asian. I know how to put it with noodles or rice, but anything else and I just feel like it doesn’t belong! The other day I made fake Spam musubi with tempeh, which was pretty good (and super Asian), but you can definitely do more with it than that. For example, my bbq tempeh, or the really great sandwich I made the other day. I cut the tempeh really small and grilled it with some baby bella mushrooms, then stirred it up with some pesto I picked up at Trader Joe’s. Put that with some spinach and wheat bread, and you’ve got yourself a really great meal. I have this bizarre obsession with vegan baked goods. I’m not a vegan, of course, but I love baking things and then saying GUESS WHAT THAT’S VEGAN! What I hate, though, is “vegan” recipes that call for “vegan butter” or “vegan cream cheese” or whatever. Taking a regular recipe and subbing in vegan versions of the ingredients doesn’t make a real vegan recipe. This past weekend my Weekend Breakfast partner in crime was busy, so I decided to go vegan just for fun. Vegan. Original recipe here. Makes 12 muffins. 2. In a medium bowl, mix together oats, milk, agave, and almond extract. 3. 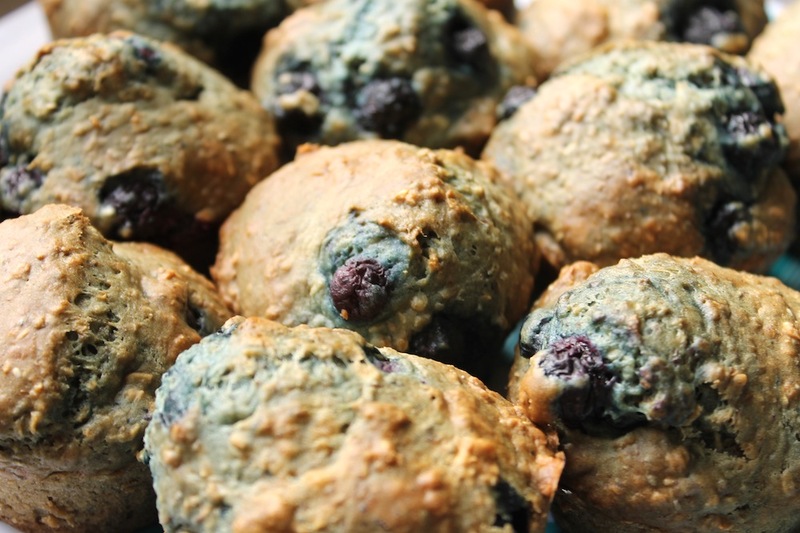 While the oats are soaking, combine flour, baking soda, baking powder, chia, flax, salt, and sugar. 4. Stir in the flax egg, walnuts, and oats. Last, add blueberries. 5. Spoon into muffin cups and bake 20-25 minutes. 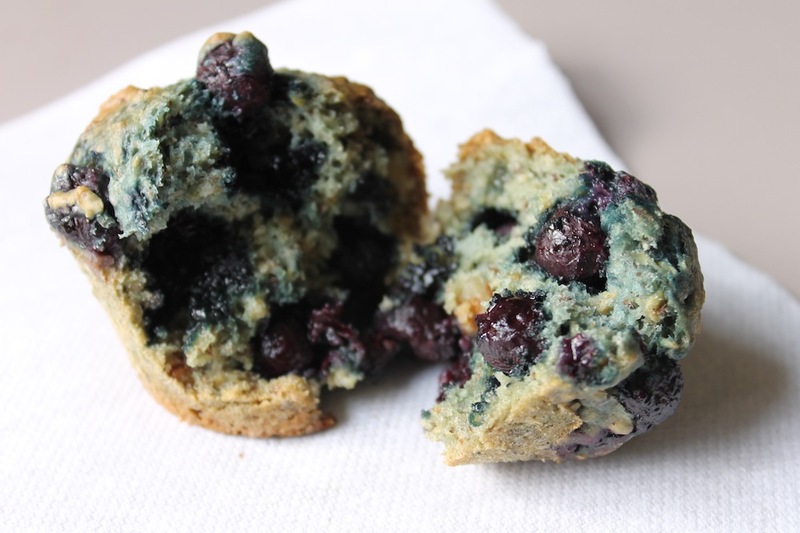 I used frozen blueberries, which was fine I think. As soon as I stirred in the berries, the batter turned a crazy greenish color. They looked like zombie muffins but they tasted great! Not too sweet – perfect for breakfast. Although I will say you have to eat them fast. Since there’s no oil in the batter, by the second day they’re already pretty dried out. I wrapped them in a damp paper towel and zapped them in the microwave for 15 seconds, which helped, but these are definitely meant to be eaten the day of.